Ocean front property Morro Bay, Morro Bay Vacation Rental family vacation, Beachside Rentals Morro Bay vacation Rentals, Ocean views beach house Morro Bay. Beautiful home in North Morro Bay with unobstructed views! You will enjoy the beautiful panoramic views this home offers with floor to ceiling windows. Beautiful rock and ocean views from the living room, kitchen and master bedroom. 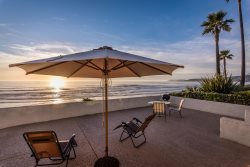 This home is a two bedrooms, two bath, + den room, single level, ocean front beach house. Master bedroom has a queen bed, second room has 2 twin beds and den room has 2 twins (trundle bed). 2 car garage plus street parking. Easy to work with and available to answer questions. We have been renting this same home for over ten years but this was our first stay here booked through Beachside Rentals. I particularly appreciated the fresh flowers and fruit bowl provided for our enjoyment by your staff. We truly enjoy staying at this property and each year we return it feels like coming home. Thank you to the property owners and Beachside Rentals for continuing to make this property available to rent.